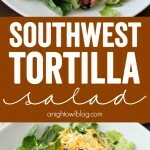 Southwest Tortilla Salad – a delicious, easy and filling salad you can make at home! Hi friends! I have a confession to make. I LOVE good salads. No, that’s not the confession, my confession is while I love good salads and order them out all the time, I never love the salads I make at home. That is, until NOW. I think that I’ve pinpointed my “at home” salad issue to the protein. I never love the chicken that I toss in the salad, which tends to ruin the whole thing. But I have found my solution – The Good Table®! General Mills® has come out with a new product that allows families to make restaurant-inspired dinners with ease, while still allowing for your own homemade, creative spin. The Good Table® products come in a variety of flavors that provide you with the ingredients to dress up your choice of protein! 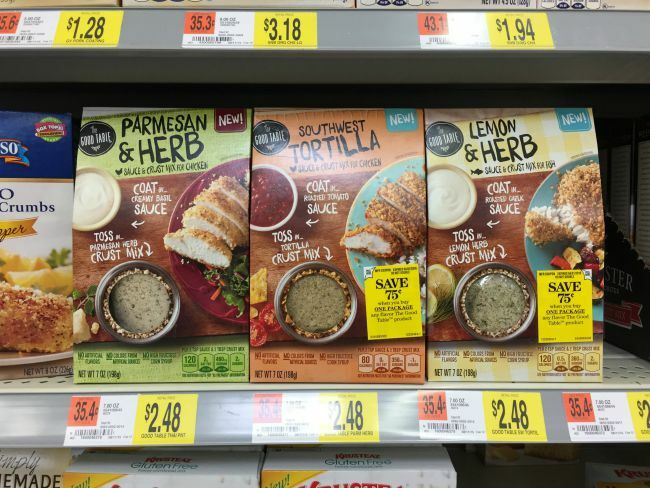 We found The Good Table® products at our local Walmart, next to the bread crumbs. 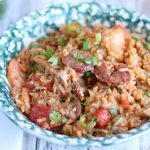 All of the flavors sounded amazing, but being in the Southwest, I naturally gravitated towards that flavor combo and knew exactly how I planned to use it! 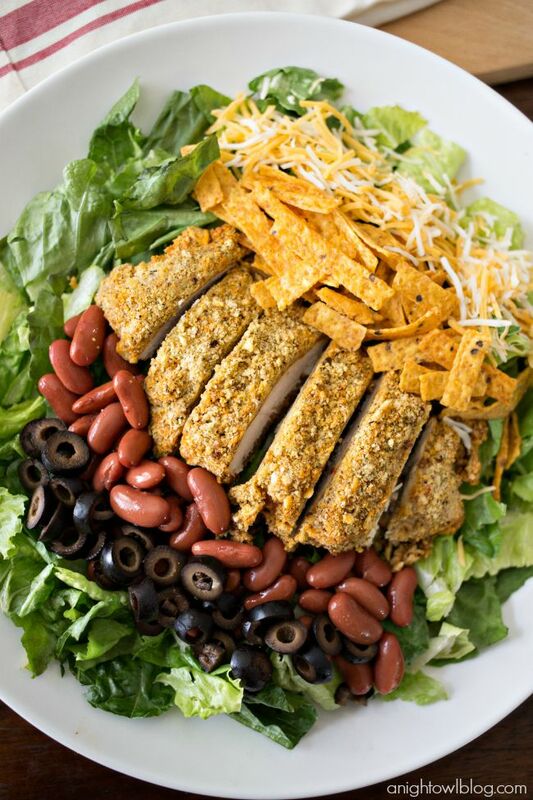 We grabbed everything we needed for a delicious Southwest Tortilla Salad – The Good Table® Southwest Tortilla, chicken, lettuce, beans, olives, tortilla strips and cheese! You can also toss in tomato and avocado as well. 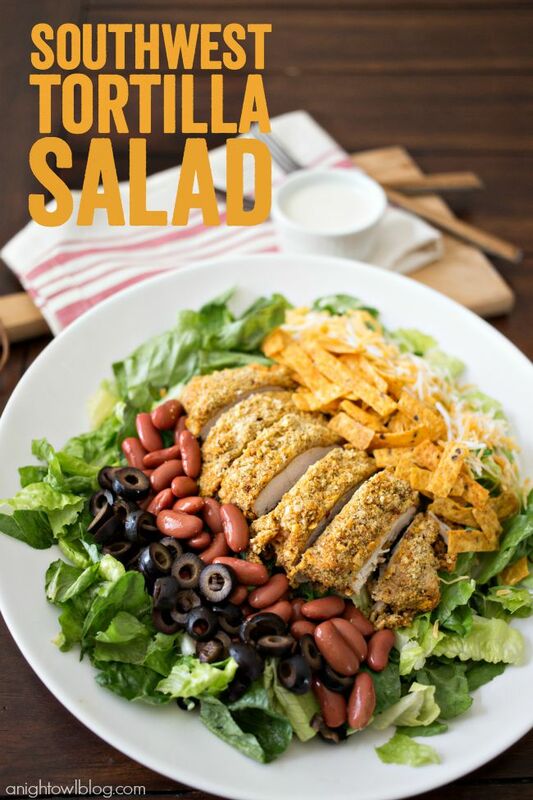 Once we were ready for the delicious salad, we simply followed the instructions on The Good Table® packaging…just dip the chicken in the sauce then coat with the yummy crust mix and get it in the oven. In just 20 minutes you have delicious crunchy-coated chicken that is PERFECT for your Southwest Tortilla Salad! 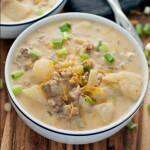 Then just top that baby off with your favorite ranch dressing and you’re ready to go! 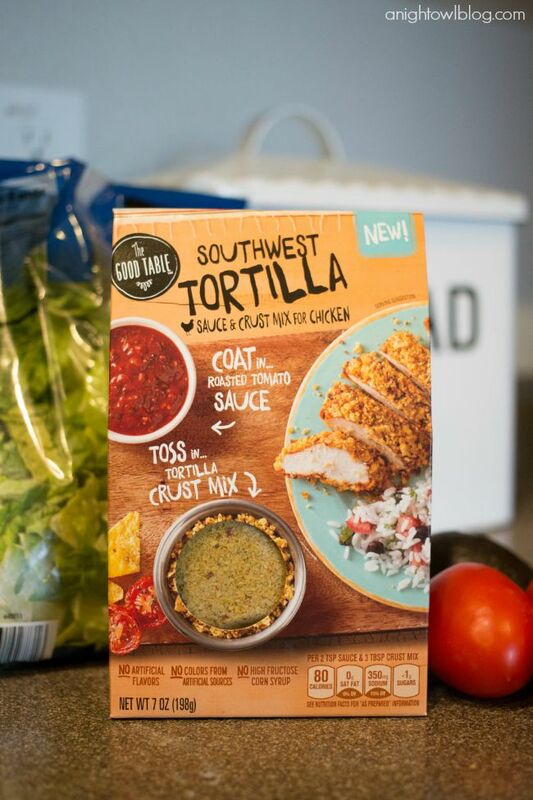 Cook your chicken according to the directions on The Good Table® Southwest Tortilla mix box. 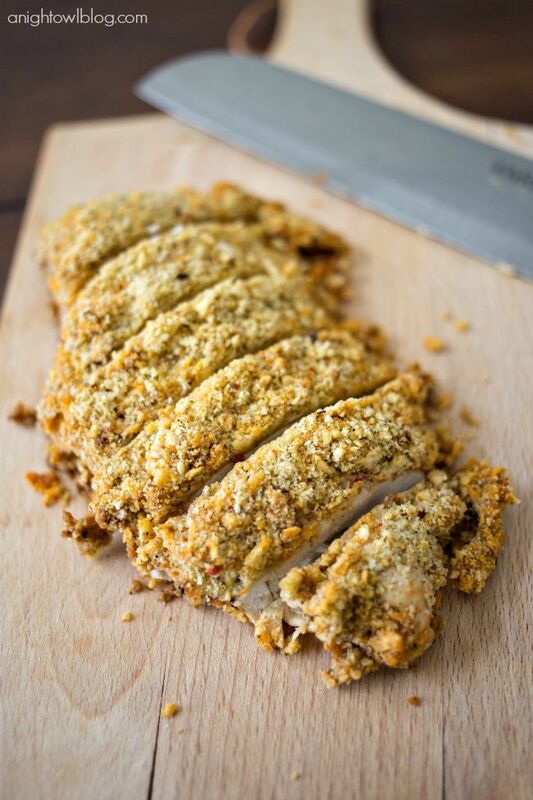 Once chicken is fully baked, let cool and cut into strips. 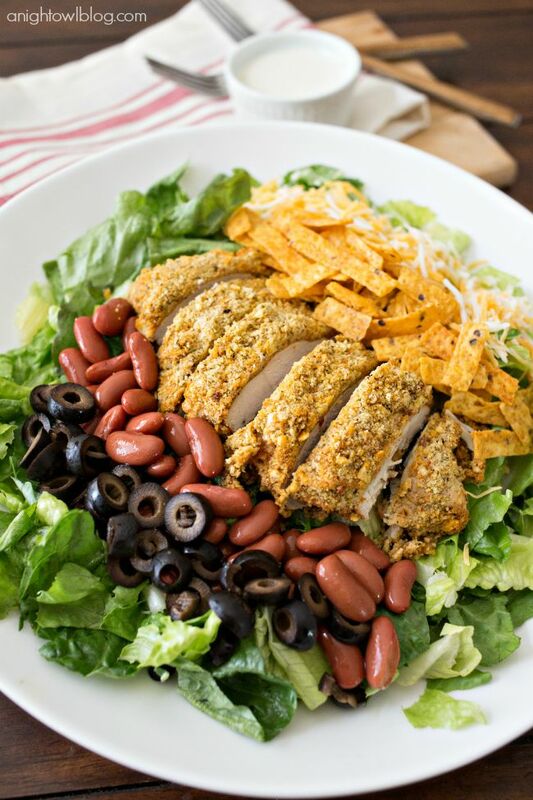 Arrange chicken on top of lettuce with beans, olives, tortilla strips, cheese and serve with ranch dressing. I was amazed at what a difference the chicken made to our homemade salad! You’d better believe we’ll be trying that again very soon – along with the other amazing The Good Table® mixes! 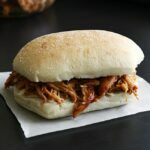 I love how The Good Table® products helped us to create a meal that was quick, easy and delicious – and now I no longer have to order out to get a restaurant quality salad (or meal!) at home. What would YOU make with The Good Table®? 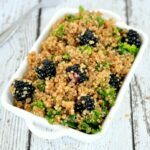 This salad looks so easy and delicious! I’ll definitely be pinning this and trying it out for next week!